Note: I looked through to see if there were any similar questions, but it appears that most of them were about eggs done over easy. I like having my fried eggs over hard. Unfortunately, it seems that I am incredibly bad at producing a final result that is in one piece. 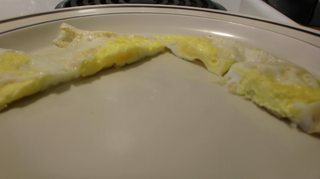 What usually happens is that when I try to turn over the egg, it breaks apart and I am left with fried egg that's in a few different pieces. How can I prevent this from happening? Crack egg(s) into pan with oil. Break yolk by poking it with a turner. Wait until egg(s) solidify somewhat, attempt to turn egg(s) (and fail miserably). It's possible that my pan is too small, but I've had this problem in the past as well with much larger frying pans, or that I'm not waiting long enough. The easiest way is just like this. 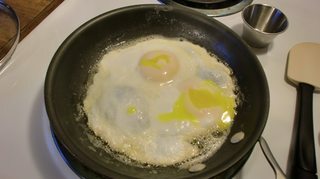 What's the best approach to get runny-yolk sunny side up fried eggs? but with broken yolks and more time. This pan would would be perfect if it had a lid that fits, but this lid will be do the trick. Your pan should be non-stick with sloping sides, 8" is perfect for 2 eggs, but larger is fine too. I set the heat to one click below medium [YMMV*], and give the burner and pan a good 2 minutes to heat up. Add the butter and let it reach the point that it stops sizzling. 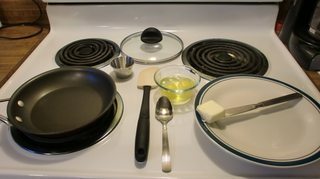 When the butter stops sizzling, add the eggs. To keep track for this answer, I set my timer at this point. Let them cook uncovered until the bottom is opaque, about 1 minute. Add about 1 tablespoon of water and cover. So far everything is just like the prior answer for sunny side up eggs. Let the eggs steam until they start to get a bit of white on top, about 1 more minute. Now poke the yolks and use a spoon to baste the top of the eggs with hot butter, replace the lid. Let them cook until they are as hard as you like them. Mine looked just about done at 3.5 minutes. Had I just let them cook one more minute, covered, they would have been fine and ready to plate. You don't need to flip. If you do choose to flip, don't do it until they eggs are very close to being done. You can use a spatula if you like, but I much prefer the pan-flip. He demonstrates it here at 3:05. Egg Flip Just be sure that your eggs are easily sliding around before you flip. The guy in the video makes it seem harder than it is. Since your yolks are already broken, it's really super easy if you have a non-stick pan with sloping sides and plenty of butter. So I flipped at 3.5 minutes, then covered and let them go for 30 more seconds. Pro trick: before you plate the eggs, use a paper towel to wipe any extra butter out of the pan, then just tilt the eggs out of the pan onto the plate, that makes for a tidy presentation. I never touched a spatula to these eggs. Break the yolks on purpose?! If you like both sides crispy, your best bet is still to put a little water (10-20ml) in the fry pan once the eggs are frying nicely, cover it with a lid and let it cook 2 minutes. At that point even the top surface will be mostly hard, and you can easily flip without breakage. Try breaking the whites too in order to get a more uniform thickness on the eggs before flipping/turning. 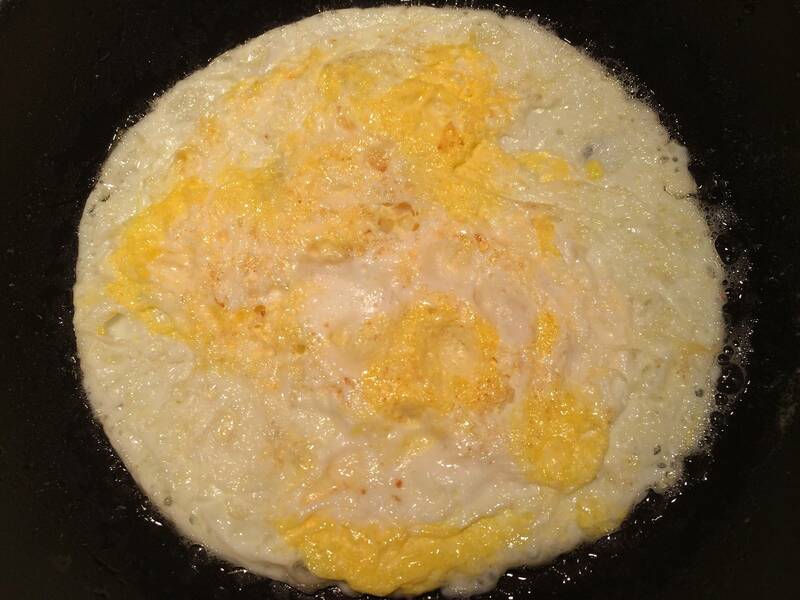 There's a runny/watery white that spreads across the pan and a more contained white which props up the yolk. Break the side of the contained white. Otherwise you'll get the typical thick and thin whites ( as seen in @jolenealaska's pics ). As already suggested, letting it set/cook a little longer should help. You don't mention any issues with the egg sticking to the pan so it seems like they are releasing fine. If you shook the pan a bit do they slide around before you try to turn them? 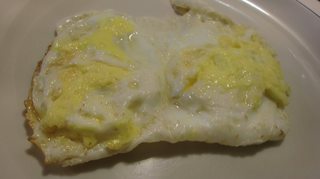 Here's a pic of over hard eggs with the whites broken (I just had these), see how uniform the thickness of the whites are? 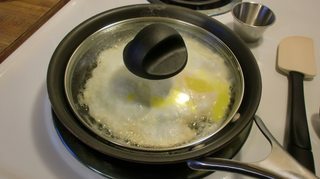 Cover the pan when the eggs are 3/4 done and it will form a slight film on the top of the egg but the yolk will still be runny. This will allow you to transfer them more easily. It's not as pretty but it's definitely easier and has the exact same taste.